SPARTA — Patricia Klebez remembers her first day as Reverend George A. Brown Memorial School’s principal. On that day back in 2016, she stood on the black top by the Reverend Brown gymnasium watching the students play. At that moment, Klebez realized there was something missing: a playground. Two years later after much discussion, planning and hard work, Klebez’s vision has come to fruition, as Reverend Brown now has a state-of-the-art playground that is located in front of the school. 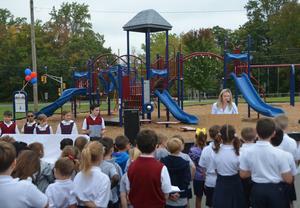 On Tuesday, the school held a dedication ceremony for the playground that will forever be part of the fabric of the school. With the help of McHugh, Pope John XXIII vice president of institutional advancement Craig Austin, Reverend Brown assistant principal Daniel Rosanelli, Our Lady of the Lake Church council, and the Diocese of Paterson, Reverend Brown has a dedicated outdoor area for students ages 5-12 to play. 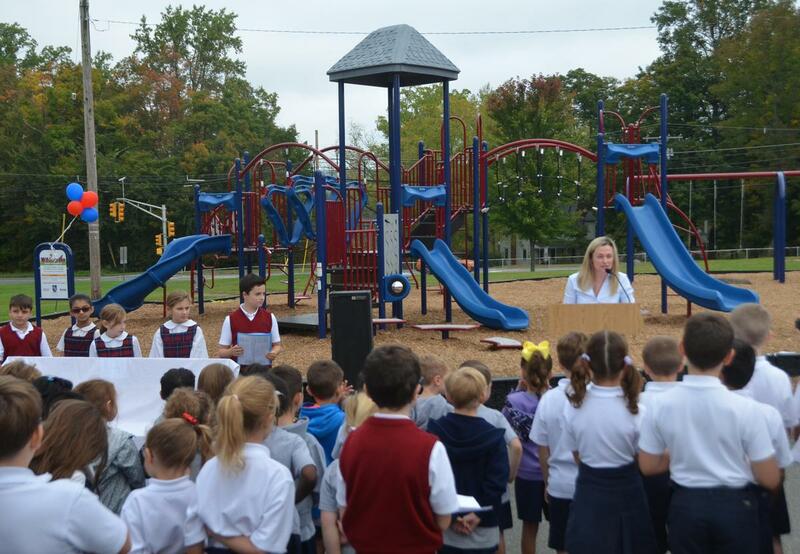 Before this new addition, the students either played in front of the school, played on a smaller playground that is located behind Our Lady of the Lake Church or used the turf fields at Pope John. 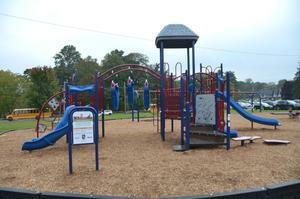 Now, the 90-by-70-foot playground features three areas of play. 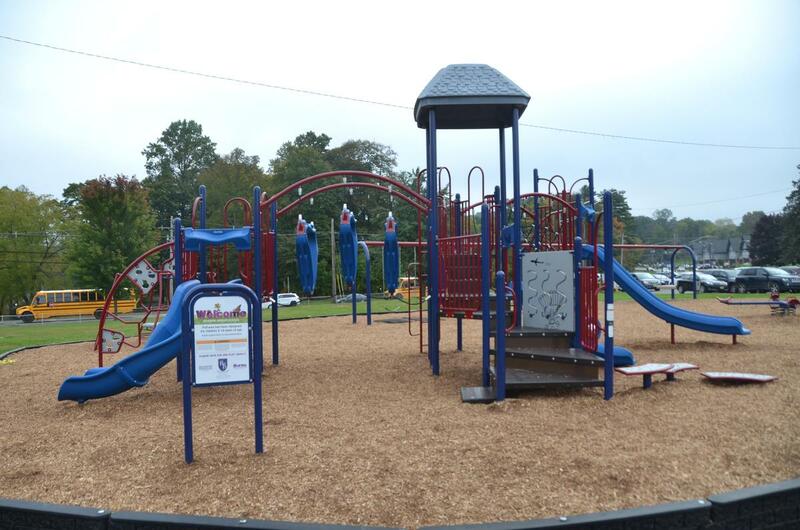 The first area consists of three slides, climbers, activity panels, a free standing climber, and monkey bars. The second area has a swing set with six swings and one tire swing, while the third area has a blue spinner. Students have already started taking advantage of the playground, something that Klebez and the school community are so happy to see. 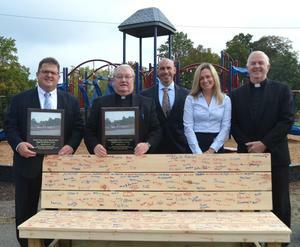 In addition to the playground, there is a wooden bench that features the signatures of all the current Reverend Brown students and those who helped with the project. 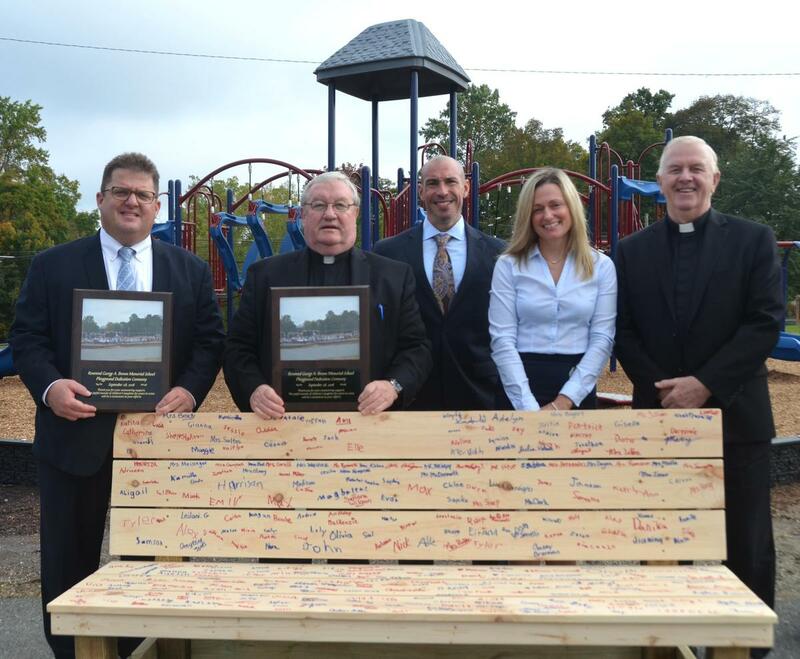 The bench was made by Reverend Brown physical education teacher Michael Wagner and was also included in the dedication ceremony, where McHugh, Austin and Our Lady of the Lake pastor Rev. David McDonnell each added their signatures as well. Now that the playground is up and running, the school looks forward to seeing its current students and its prospective students make memories while developing into the future leaders of tomorrow. “It is going to add to the overall appeal of what Reverend Brown can offer,” Klebez said. “We are a faith-filled community. We look out and care for the whole child. When we say that we really care for and nurture the academic, social, emotional, physical and spiritual sides of the child, we are true to that word and mission. For more pictures from the dedication ceremony, visit our Facebook page!